The Cutts Family is this month’s members of the month! This is one family who really knows Crossfit! 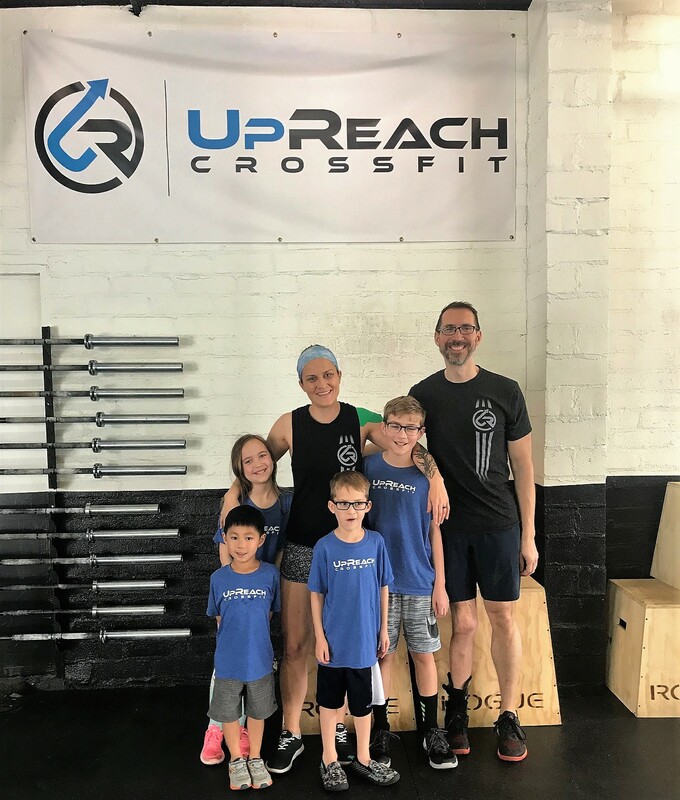 Adam, Erin, and Eli are active members, while Gavin, Teagen, and Ming attend every class and wait patiently for mom, dad, and Eli to finish their workouts. What led you to try out Crossfit? Eli – I wanted to try it out to see how it went. Also, my parents were really wanting me to try it. Erin and Adam – It had been a rough few years for the family. Lots of changes had taken place in our lives in the previous years that kept us us from being active, 10 years to be exact. After a fun night at home with the family (and maybe a few glasses of wine) an email was sent to a gym to inquire about membership. I had started to Crossfit before Adam this go round. Adam had done Crossfit before and ended up with a severe injury. After a few month, Adam rejoined Crossfit with me. From that point forward, the commitment to Crossfit and fitness was made by the family. What is your favorite part about UpReach? Eli – Rope climbing for sure! Erin and Adam – UpReach is so friendly, nice, clean, GREAT COACHING, light and cheery! This place is the whole package! What is the biggest change that you have seen since starting Crossfit? Adam – Stability, muscle mass increase, confidence, and just overall happier in life. Who would win a fight between Superman and Batman? Eli – Batman. For two reasons. A) I am a big fan! B) He has no super powers. He makes his own weapons. Adam – Superman should win because he can’t be defeated except by depriving him of sunlight or exposing him to kyptonite. Batman was able to do both to him because he is smart. HUGE THANKS TO THE CUTTS FAMILY for participating in this month member of the month interview! We look forward to sharing each of your stories in the following months!